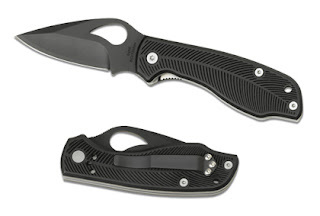 The Crow is a small pocket knife by Byrd a branch of spyderco knives. The knife is 6 5/8'' long (168mm) and has a 2 13/16'' blade (71mm) so it is safe under most regional regulations to carry (check yours). When closed the knife is 3 7/8'' (98mm). It weights 3.5oz (100g). The blade is made of 8CR13MoV steel, strong enough for most cutting jobs without being a premium material making the knife less expensive. The handles are made of anodized aluminium. The locking mechanism is a liner lock that seemed to be quite stable in our tests. To assist one handed operation the Crow has a generous thumbhole that makes opening and closing the knife with one hand a simple operation. The pattern in the handle has a nice pattern that makes the grip quite solid. The shape of the knife and the blade are quite good with a small curve to rest the index finger behind the blade that helps with tighter grips if needed. While the Crow won't be impossible to break it really seems to be solid enough to be used as an EDC knife going thru normal cutting jobs without a problem. The price makes this a very interesting product. You can read more and order from Spyderco for $28. The L0D is a multi-mode AAA light using a Cree LED. The light is activated with a simpe twisty switch. Twist to turn on and untwist to turn off. Turning on and off in sequence changes modes, the first mode is primary, then low, maximum, strobe and SOS. The flashlight accepts voltage from 0.8v to 3.7v so it can be used with alkaline AAAs, rechargeable AAAs, lithium AAAs or even rechargeable 10440 3.7v cells. 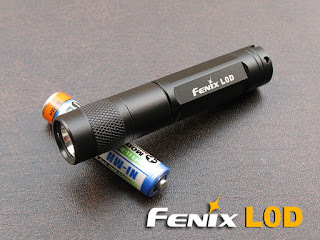 Using the 10440 battery the light will be extremely bright probably outperforming not only other AAA flashlights but other bigger flashlights as well. The performance of the Cree LEDs is really amazing. Our tests with a 10440 battery show an amount of light around 120 lumen, a number that is huge for bigger lights. The light is coonstructed in HA-III anodized aluminium, resistant to impacts and scratches, it will go very well in a keychain without getting scratched, it weights about 14grams without the battery and measures just a little more than the AAA cell that it uses. Orings make the light water resistant and dunkable. A nice keychain light that with a rechargeable 10440 battery can become a keychain rocket. This is probably the best AAA light in the market at the moment this review was written, the brightness is outstanding and the brightness levels are good to use it in many different situations. You can read more and order for $43.50 from Fenix-Store. This is a battery tester that measures the battery capacity and not its voltage, the capacity is a far better way to know how much juice the battery has left, in many batteries the voltage will be constant until the cell is near exaustion so measuring voltage has no purpose. This model can measure more than 30 battery types, including Alkaline, Lithium and Rechargeable C, D, AA and AAA batteries. Primary and rechargeables 123 and CR2 batteries.18500, 17650, 18650, 3v lithium coin like CR2016 and CR2032. A23 batteries, 9v batteries, and many others. 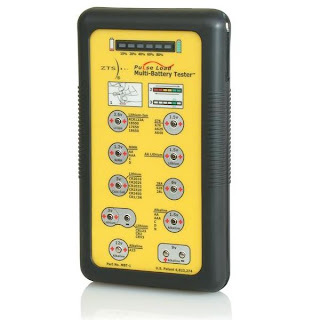 It is practical to say that it will be hard for you to have a battery type that can't be measured with this tester. 104500 batteries can be tested even if not listed and some smaller batteries like 10440s can also be tested but it is not recommended to test more than once because the test may take a margin of the battery charge. Using the tester is very simple: Put the battery with the positive pointing down in its place and use the small probe in the negative contact, percentage of remaining battery capacity is indicated on the LED bar display. The test takes aproximately 2 seconds per cell. Given that mixing lithium batteries with different charge in a flashlight can result in an explosion (according to several reports) the tester is a good way to know both cells are in the same state of charge. A very nice tester that can be used in a huge number of batteries. You can read more or order for $60 from Lighthound. 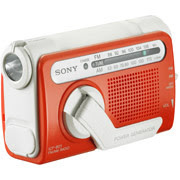 This is a little emergency radio by Sony, it has both AM and FM frequencies and a LED light as well. The radio can take either 2 AAA batteries or be powered by a crank mechanism, pull the lever give it a few cranks and the radio will be self-powered without needing batteries. With AAA batteries you can get 50 hours of AM radio, 40 hours of FM radio or 30 hours of the flashlight. With the built-in generator you can get 60 minutes of AM radio, 40 minutes of FM or 15 minutes of the flashlight, then you have to crank it again to generate more power. It is small enough to be carried in a kit without taking a lot of space. The drawbacks are not having weather stations or shortwave reception. In areas where tornados, hurricanes and other natural disasters are common batteries can be very hard to get and a radio to know what is going on is always needed. We really liked that a very reputable brand like Sony has a crank activated emergency radio, it makes sense to keep one in your kits for emergencies or long hikes without needing a stock of batteries. It is also good for camping if you have reception of AM or FM bands you can keep updated on major events or enjoy some music. You can read more or order for $40 from Sony. How many times have you used your own breath to warm your gloves blowing warm air inside? This company has taken this idea to their new line of gloves putting a small valve that can be used to blow air inside the gloves to keep your hands warmer. The gloves are made of insulating material with a trademarked material reinforcement in the palm and fingers. The Cuff and Strap are made of neoprene and the palm of synthetic leather. The knuckles are also neoprene. The Exhale heating system will let you blow air from your lungs inside the gloves and unless something really bad is happening to you warm air will fill your gloves making your hands more confortable and reducing the risks of frostbite. It is a nice system for situations where you need to remove your gloves to do some task and the put them back on, add a blow of air and your cold hands will get better sooner. The Gloves can be ordered in different models depending on the insulation capabilities, you can get more information or order from $35 from Gorgonz's website. The Imp is a very nice small knife by Peter Atwood, the total length of the knife is 3 1/8'' inches and it is made of 3V steel. The knife is 5/32'' thick and has a chisel style blade. The handle, in this case, is plain steel wrapped in paracord. The end of the knife is shaped to be used as a screwdriver tip which is a very nice detail. The steel used holds the edge in an excellent way, the shape of the blade and the knife in general is very confortable to use and very practical to cut, as a knife made from one solid piece of steel it will be completely unbreakable and very reliable for the most demanding cutting jobs. The cord handle offers a good grip and the crenelations opposite the blade help a lot and add a nice detail. The Imp comes with a kydex sheath and beaded chain, so it is probably designed to be a neck-carry knife, if you prefer to carry it in your pocket a mini teklok belt clip is available for an extra $5. 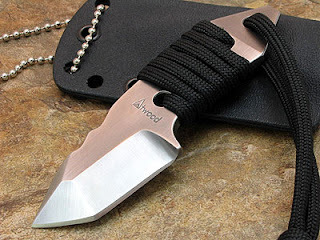 A very good looking and serviceable knife that is probably among the best we have seen for neck carry, maybe a little bulky for some people to carry in a neckchain. You can read more or order for $95 from Peter Atwood's website. 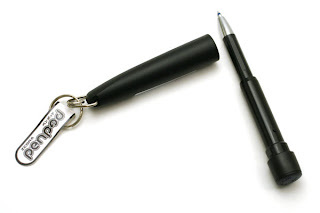 The PenPod is a collapsible keychain pen by Zebra. Extended the pen is 3 1/2'' long. When you want to close it you push the pen inside the cap collapsing it via a spring inside and then twist to secure it inside the cap. Once collapsed the pen is 3'' long. The spring and twist mechanism seems to be solid. The pen has a small hole for a splitring in the cap. The cap does not fit the end of the pen so the idea is to leave the cap on your keychain when using it. The length of the extended pen is fine to write for me and the ink runs well but there is a lot of subjective factors so you probably need to try it to judge. The pen is nice to hold and the best thing is that it is very easy to remove and put in the cap so it is very handy when you need something to write in a hurry. It doesn't add a lot of weight to your keychain either. The only drawback is that the difference between the collapsed and extended pen is not a lot and you still have to push and twist to store it, only for half an inch.